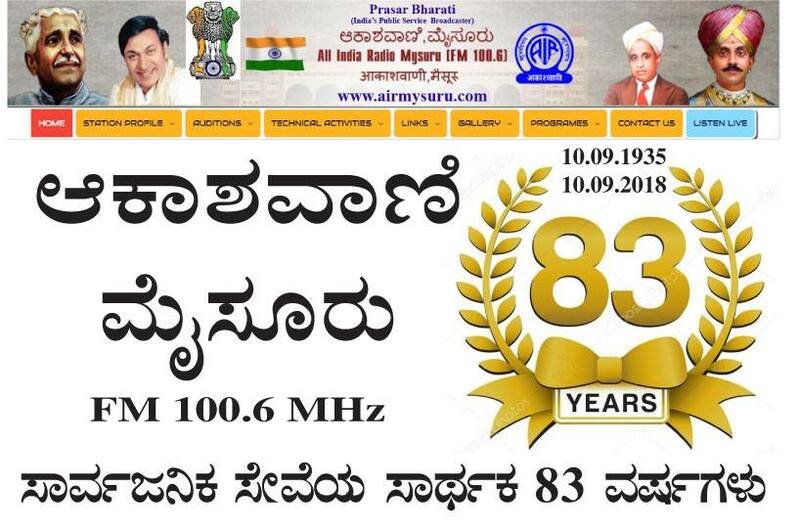 All India Radio, Mysore came into existence on 10.09.1935 as an amateur attempt by Prof. M.V.Gopalaswamy, a Professor of Psychology in University of Mysore, which, over the years, evolved into a professional broadcasting institution. In fact,he is credited with having given the Indian Name "AKASHVANI" to All India Radio, which is said to have been endorsed by Government of India later. All India Radio, Mysore was a private enterprise till 1942 when Mysore City municipal Council under the Princely State of Mysore took over it. However, after independence, the station was taken over by Government of India and it came under the administration of Ministry of Information and Broadcasting. In 1950, the station was shifted to Bangalore. After a gap of 24 years i.e. in 14.11.1974, All India Radio, Mysore was re-commissioned with 1 KW MW Transmitter. This transmitter was replaced by 10 KW FM Transmitter on 01.01.2003 with a coverage radius of 60 Kms. As such, the districts of Mysore, Mandya and Chamarajanagar come under programme zone of the station. At present, All India Radio, Mysore is airing programmes from 05.55 AM to 11.05 PM. Mysore being the cultural capital of the state, has a rich resource of classical, light and folk music. All India Radio, Mysore is equipped with talented Staff Artists as well as Auditioned artists on casual panel. Besides Classical Music, Drama and Features, the station broadcasts a wide variety of spoken word programmes and special audience programmes for all categories of listeners ranging from tiny tots to men of letters, as Mysore is a city of Universities and a variety of Institutions with disciplines raging from Food Technology to oriental Research. 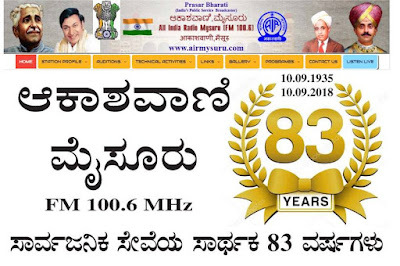 All India Radio, Mysore has organized many a Radio Sangeeth Sammelana and has won quite a few awards in National and State Level Competitions which include Akashvani Annual Awards also. Commemorating the Platinum Jubilee of the station, year long celebrations were held during 2010-2011. By periodical revamping of programmes, with the cultural flavor of Karnataka & Mysuru, it has been able to stand in tune with changing trends without compromising the basic tenets of National Broadcast.